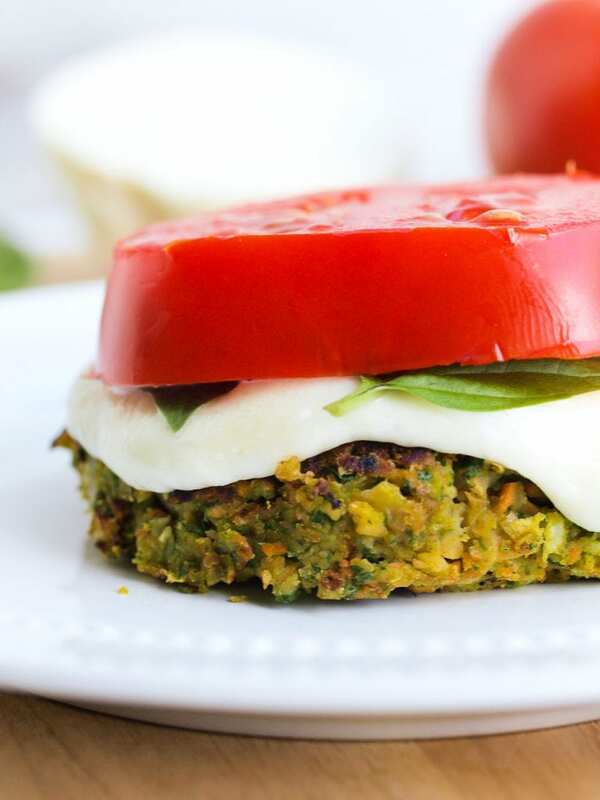 This Caprese Chickpea Veggie Burger makes a quick, easy, and healthy dinner! I’m on a bit of a veggie burger kick. What’s not to love? They are easy to throw together, quick, and a great way to add a variety of vegetables to your main course. And they’re so satisfying. A good veggie burger leaves me feeling full, but not stuffed. Dinner perfection. This one has carrots, kale, and basil mixed with chickpeas to make the burger. It’s complimented by one of my favorite summer flavor combinations: tomato, fresh mozzarella cheese, and more basil. Don’t underestimate the Caprese part of this burger. It really brings all the flavors together and makes this excellent. I actually thought this was just as good without a bun as it was with a bun. Feel free to eat it either way. If you use gluten-free breadcrumbs this will be a gluten-free dinner. I haven’t tried baking these because I much prefer the texture from cooking veggie burgers on the stovetop with a little oil. It helps give a little crunch to the outside, and they are soft in the middle. I prefer to use avocado oil for this these days. This Lodge Cast Iron pan is absolutely perfect for the task. My cast iron pan is one of my favorites of all time. You don’t need to use much oil because food doesn’t stick in cast iron like some other surfaces (Naturally! No non-stick chemicals here.) and it fortifies your food with iron. Bonus! 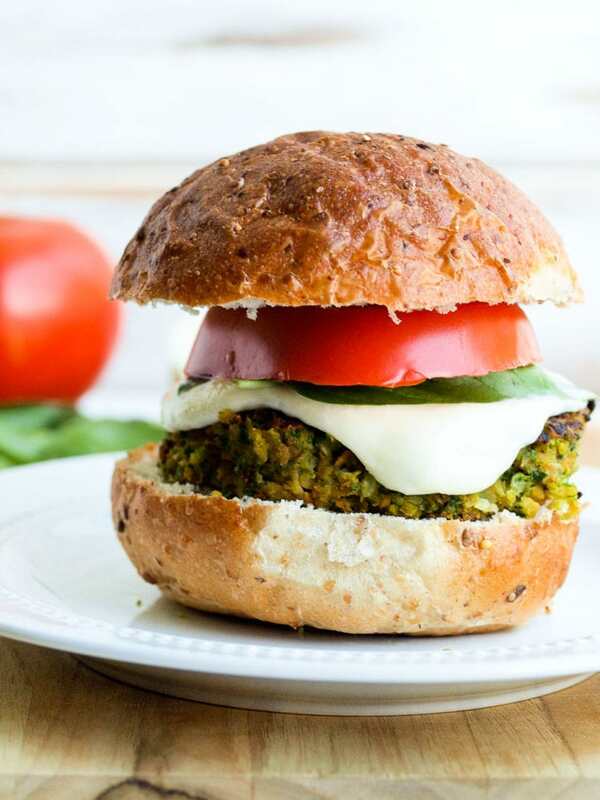 These Chickpea Veggie Burgers come together really quickly. I hope you’ll put them on your dinner menu soon! Please come back tomorrow to read the final update from the Gallon a Day Water Challenge and hear what the July Challenge is going to be! Can you believe June is already gone?! 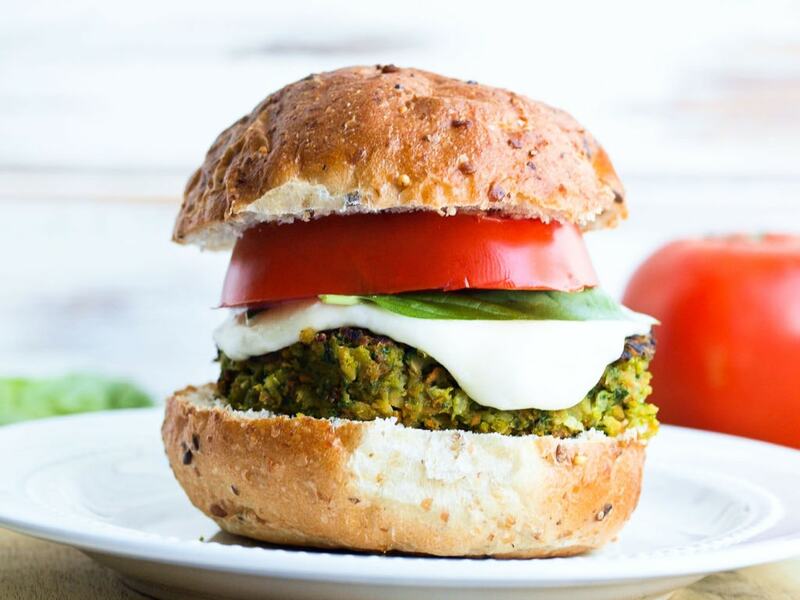 This Caprese Chickpea Veggie Burger combines vegetables and chickpeas for a hearty burger that pairs perfectly with its Caprese toppings! Put the carrots, kale leaves, garlic clove, onion, and 10 basil leaves in the food processor. Process until they are broken down, but not total mush. Add the chickpeas, salt, and pepper, and pulse until the chickpeas are broken down and incorporated. Stir in the egg and breadcrumbs. 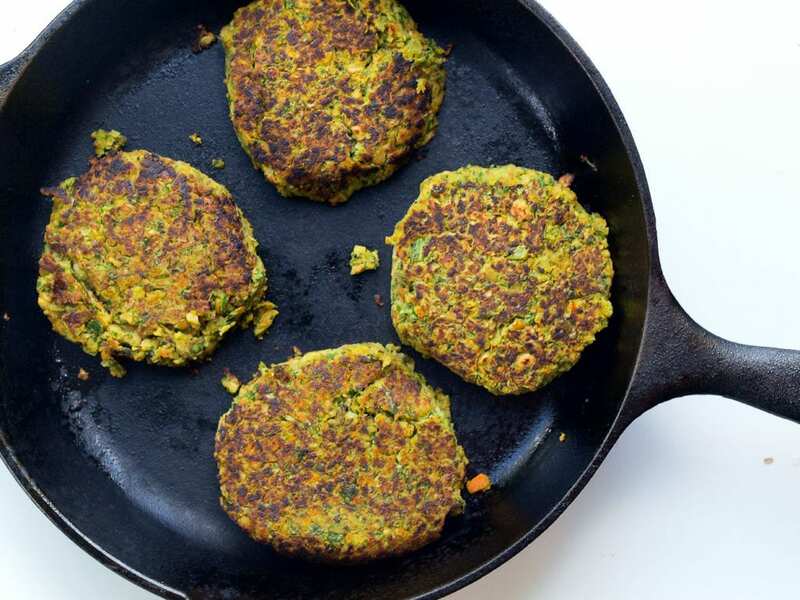 Form the chickpea mixture into five balls and flatten them to a burger shape. In an overproof grill pan or large skillet, heat a thin layer of oil over medium high heat. The burgers should sizzle when you put them in the pan. If they don’t, your pan isn’t hot enough. Cook the burgers about 5 minutes, carefully turn them over and cook an additional 5 minutes. Meanwhile, preheat your oven’s broiler. Add a slice of mozzarella to each burger and transfer to the oven. Broil until the cheese is melted, 2-3 minutes. Top each burger with 2 basil leaves and a tomato slice. Maryea, did you happen to test these with a flax egg? I love veggie burgers, but have difficulty making them without eggs (my 4 year old is allergic to eggs). Thank you! That doesn’t mean it definitely wouldn’t work, but I can’t say with confidence that it will. Please do let me know if you try it!